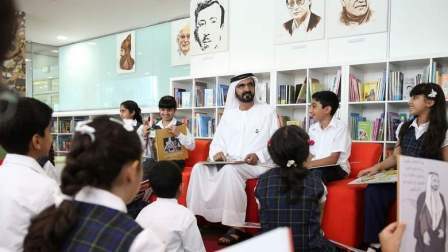 A total of one million books will be supplied to school libraries across the UAE, thanks to a new initiative by His Highness Sheikh Mohammed bin Rashid Al Maktoum, Vice-President and Prime Minister of the UAE and Ruler of Dubai. Sheikh Mohammed said that the effort aims to establish reading as a habit in the country. "Today, we are announcing an initiative to support our school libraries with a million new books," he said. He said that there is a reading law which aims to encourage 80 per cent of students to read. The objective is to prepare a generation that is in step with the future. It will also cement the UAE's leading position as a knowledge society. Sheikh Mohammed added that "we can't create a tolerant society and build stable families without the culture of reading which promotes knowledge". "Today marks the beginning of the UAE's Month of Reading, where every person works on instilling this civilised habit in our society and for future generations," Sheikh Mohammed said. The launch of the initiative coincides with the UAE's Reading Month, which was launched as part of the UAE Reading Strategy.